1. Chop the tender bottom parts of the lemongrass and grind together with coriander leaves (reserve a few for garnish), small onion, ginger to a fine paste. 2. Combine the lime juice, fish sauce and sugar. Keep aside until required. 4. Add the lemongrass mixture and cook for 30 to 60 seconds. 5. Add the sweet corn kernels and chicken stock. 6. Reduce flame and cover the pan with a lid. 7. SImmer for about 6 to 10 minutes. 8. Add the curry paste, coconut milk and fish sauce mixture. 10. Add the fish pieces and reduce flame. 11. Cover and cook till the fish is cooked and tender, for about 4 to 5 minutes. 12. Transfer to a serving bowl. 13. Garnish with basil and coriander leaves. 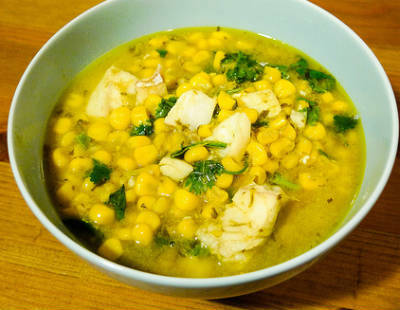 Feel free to comment or share your thoughts on this Thai Fish and Corn Curry Recipe from Awesome Cuisine.